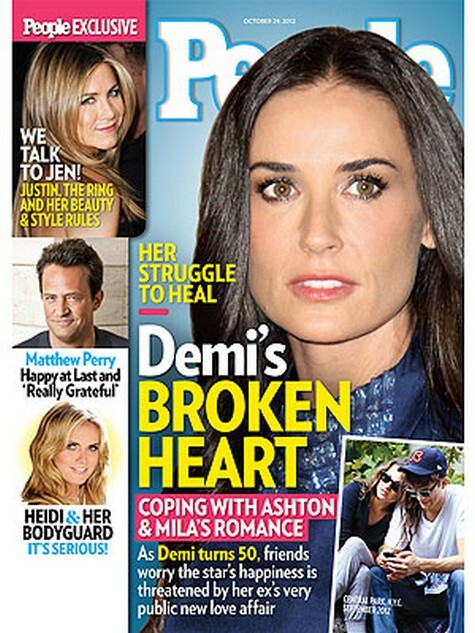 The current issue of People magazine features the cover story “Her Struggle To Heal – Demi’s Broken Heart!” The magazine this week has decided to focus on the romance of Demi Moore’s ex, Ashton Kutcher with Mila Kunis and how Demi is dealing with her broken heart. Demi will turn 50 on on November 11th, 2012, and friends are worried that Demi’s happiness is being threatened by Ashton flaunting his affair with Mila, for the whole world to see. Rumor has it things are rapidly moving full steam ahead for Ashton and Mila so much so that Ashton’s itching to marry Mila. Obviously Demi is not handling her ex-husband dating the sexiest woman in the world very well. With Demi’s 50th birthday approaching it is probably even harder to handle her ex-hubby dating 29-year-old Mila Kunis. One source close to her says she is “jealous and frustrated” by the romance. Demi is struggling to heal and is finding it impossible when Ashton and Mila are not keeping it on the down-low, and have been spotted huggin’ and kissin’ all over NYC lately. With her weight plummeting, no job and her kids not talk to her it looks like her friends have reason to worry. To find out more about Demi’s struggle to cope and why her divorce to Ashton is not finalized pick up the current issue of People Magazine.